Design of RCC column using Analysis results from STAADPro as well as the for design forces entered Manually. Useful for extracting analysis Results from STAAD to Excel for further processing of results. Plotting Levels easily to Autocad. And earthwork calculation to Excel. Simple to use. Only want to enter the data of cross sections such as Chainage, Reduced level and offests to excel sheet, remaining things can be done in minutes using PlotCS. Raw data can be edited easily with basic knowledge in MS Excel. Output - Level Area calculation and Level Quantity calculation can be modified as desired. Output- Plots such as cross sections and Longitudinal sections Can be modified as required. 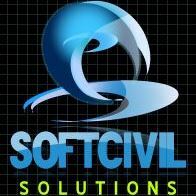 SoftCivil Solutions. Powered by Blogger.